These studies are sketches for project eighteen of the Relationship Series. The large exhibition planned for the summer is on the theme: THE PAINTER WITH WOMEN:- Observations on the theme of the Double. 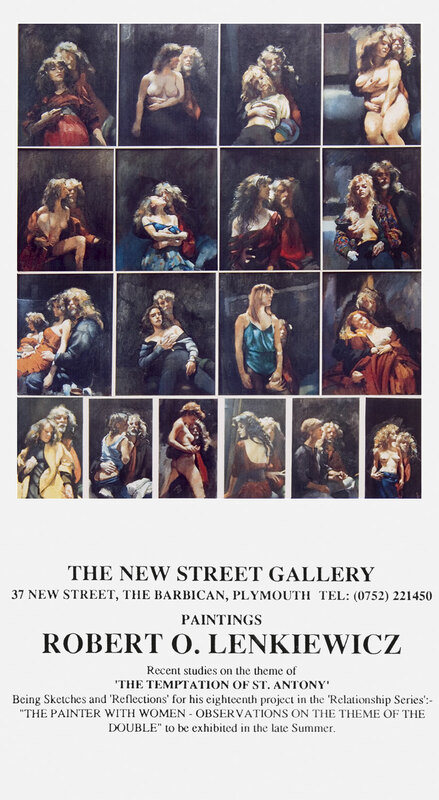 (This eighteenth project in the summer will probably be the last large scale exhibition by Lenkiewicz in the city as he loses his studio in October in order that the handsome Georgian warehouse can be convened into another pub/club/restaurant). Of the three issues that have preoccupied the painter in this project, the “folly of wise men” formula and the “reflection” formula are significant. The acclaimed father of Christian Monasticism was St. Antony t he Anchorite or Egypt. His personal struggle and eventual triumph was an epic moral tale of heroic asceticism versus the weakness of the flesh. The traditional metaphor of Lust is ironically presented in these studies with the painter as St. Antony. It need hardly be emphasised that the painter does not share St. Antony’s motivation. He is however, interested in the thesis that there is no fool like an old fool. The formula of the “Reflection” is complex. Philosophers have been fascinated by it for centuries. From Descartes on we turn away from straight forward consideration of objects towards a consideration of the experience in which objects are given. We thematize the subject of thought itself. Self-reflection marks the human being’s rise to the rank of a subject. In Greek and Latin philosophy the term “Reflection” has optic connotations – the mirror surface throws back light. Unlike the common notion of reflection, reflection as a philosophical concept requires that the action of reproduction also be thrown back upon itself. Where these studies are concerned the reflection formula is a metaphor for thinking. Enshrined in our culture amidst a million ghostly truisms ... we stare into the dark, into the deepest shadows, and barely make out the diluted shape of Narcissus gazing fixedly upon the surface of the reflecting pool. He is the first artist, man transfixed by a reflection. The reflection in the mirror is the reflection of the “real world” but the “real world” too is the reflection of endless reflections. Voltaire once said that in every relationship there are a minimum of six people: you; the person talking to you; the person you think you are; the person you think they are; the person they think they are and the person they think you are. The reflecting surface of a mirror is an optical variant of the reflecting surface of your compan­ion. The mirror may have one surface; had a satyr dropped a stone into Narcissus’ pool his reflection would disappear like a many-faceted diamond. I look into the mirror, I speculate, I reflect; upon the reflection. To reflect significantly is like flight. A view from a great height extends the reflection, it may not focus it into meaning. One’s environment and culture, one’s relationships, one’s passions, one’s deepest and most willed intentions may be nothing more than a broken mirror. To break a mirror brings bad luck they say, perhaps that is because a broken mirror is the closest we get to our own reality. 1. THE PAINTER WITH PATTI AVERY. 2. THE PAINTER WITH KAREN CIAMBRIELLO. 3. THE PAINTER WITH 'GREENIE'. 4. THE PAINTER WITH ESTHER DALLAWAY. 5. THE PAINTER WITH SAMANTHA TUCKER. 6. THE PAINTER WITH ESTHER DALLAWAY. 7. THE PAINTER WITH RIA NEY-HOCH. 8. THE PAINTER WITH SUSAN WILDMAN. 9. THE PAINTER WITH PATTI AVERY. 10. THE PAINTER WITH SUSAN WILDMAN. 11. THE PAINTER WITH ESTHER DALLAWAY. 12. THE PAINTER WITH KAREN CIAMBRIELLO. 13. THE PAINTER WITH JENNY GIBSON. 14. THE PAINTER WITH ESTHER DALLAWAY. 15. THE PAINTER WITH LOUISE COURTNELL. 16. THE PAINTER WITH JANINE PECORINI. 17. THE PAINTER WITH YANA BERNADETTE TREVAIL. 18. THE PAINTER WITH MARY FRENCH. 19. THE PAINTER WITH WENDY RIDGEWAY. 20. THE PAINTER WITH ESTHER DALLAWAY. 21. THE PAINTER WITH ELAINE ARMSTRONG. 22. THE PAINTER WITH RIA NEY-HOCH. 23. THE PAINTER WITH EVE STROUD. 24. THE PAINTER WITH KAREN CIAMBRIELLO. 25. THE PAINTER WITH KAREN CIAMBRIELLO. 26. THE PAINTER WITH JASCHA LENKIEWICZ. 27. THE PAINTER WITH JACKIE TURNER. 28. THE PAINTER WITH WENDY RIDGEWAY. 29. THE PAINTER WITH ELAINE ARMSTRONG. 30. THE PAINTER WITH 'GREENIE'. 31. THE PAINTER WITH PATTI AVERY. 32. THE PAINTER WITH ESTHER DALLAWAY. 33. THE PAINTER WITH EVE STROUD. 34. THE PAINTER WITH JANINE PECORINI. 35. THE PAINTER WITH ESTHER DALLAWAY. 36. THE PAINTER WITH JANINE PECORINI. 37. THE PAINTER WITH GILLIAN MILES. 38. THE PAINTER WITH ESTHER DALLAWAY. 39. THE PAINTER WITH DAWN BRAZIER. 40. THE PAINTER WITH ESTHER DALLAWAY. 41. THE PAINTER WITH SUSAN WILDMAN. 42. THE PAINTER WITH JENNY GIBSON. 43. THE PAINTER WITH ELAINE ARMSTRONG. 44. THE PAINTER WITH ESTHER DALLAWAY. 45. THE PAINTER WITH KAREN CIAMBRIELLO. 46. THE PAINTER WITH PATTI AVERY. 47. THE PAINTER WITH LINDSAY SEERS. 48. THE PAINTER WITH 'GREENIE'. 49. THE PAINTER WITH YANA BERNADETTE TREVAIL. 50. THE PAINTER WITH CAROLINE SHREEHAN. 51. THE PAINTER WITH LINDSAY SEERS. 52. THE PAINTER WITH MEGAN CLAY. 53. THE PAINTER WITH YANA BERNADETTE TREVAIL. 54. THE PAINTER WITH KAREN CIAMBRIELLO.